CMYK stands for Cyan, Magenta, Yellow and Key (Black). RGB stands for Red, Green and Blue. 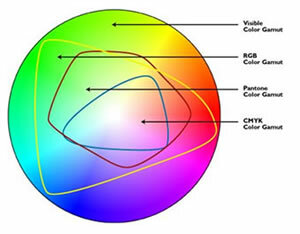 Both CMYK and RGB are colour spaces (gamut). Colour space is the area of visible or reproducible colours. The most important thing to remember that RGB colour space is used to display colour in the monitors, TVs and other devices that use additive colours. 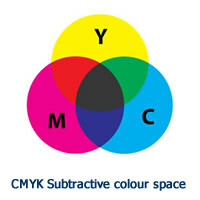 CMYK colour space is used in print production equipment and it is also called subtractive colours. Additive colours are colours that when you overlap (add together) result in a lighter colour. If you add Red, Green and Blue colours together you will get a white colour. That is why your computer monitor is black but you can get white colours because it uses RGB or additive colour space. Subtractive colour space is the one that is “subtracting” a white colour when mixed together. When you mix or overlap inks the result colour is darker or black. So when you mix Cyan, Magenta and Yellow inks together on the white paper you are “subtracting” the whiteness from the paper. If you are not a professional designer or using a graphic software that doesn’t support CMYK colour space, then the chances that your provided files to print are in CMYK colour space are very slim. So then how do we print them? Well, in order for us to be able to print your files on our presses we will need to convert them in CMYK colour space because presses use CMYK inks. A mathematical algorithm is required to convert RGB file to CMYK colour space, because RGB uses 3 arguments to create a colour, where CMYK uses 4 arguments. That mathematical algorithm is called a colour profile. There are some limitations when converting a colour from one colour space to another. CMYK colour space is the smallest because of ink pigmentation and 4 colour mixing process. RGB colour space is much bigger. 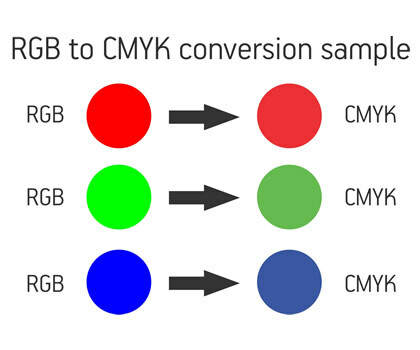 Now image that your selected colour in RGB is outside CMYK colour space, which means that to reproduce that colour with 4 (CMYK) inks is impossible. 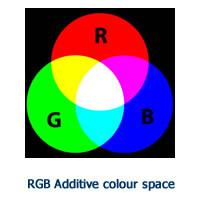 In such situation that RGB colour is called out of gamut colour. Most out of gamut colours are unusually bright like a very bright blue, green, orange or glowing red. In most situations converted files have a very slight colour shift or not at all if designed properly. But if a file contains out of gamut colour, the conversion may result in visible colour shift. With all that said it is possible to reproduce some bright RGB colours using Spot colour (Pantone) process which is different from CMYK and require a dedicated press run. More about Spot colours you will find in another topic. Don’t choose unusually bright colours when working in RGB colour space because that may result in colour shift when they are converted to CMYK. Software like Word, Power Pointer and Publisher only supports RGB colour space.